Big Ben became functional in London on 7th September 1859 | Cafe Arjun - 15 times WordPress Top Blog! There is a question that rules the Google trends charts every morning. Where it originates from is still a mystery, but AMERICA wants to know the answer. What happened in London on September 7th, 1859? A gigantic time machine that sits inside the houses of Parliament in London and is the icon for which London is most famous. The hours hand is 9 feet long and minutes hand is 14 feet long. Big Ben and the London Eye (slightly visible) at night. Majestic! the question is part of a daily marriott contest. The question comes from a Marriott contest. These questions are being posed by Marriot World of Rewards contest. In fact I found the answer on your blog when searching for the answer! I guess that means my chances of winning aren’t too good if there are so many people playing! Big Ben is called Big Ben because it was named after Sir Benjamin Hall who was the chief installation manager, some people also believe that it was named after an English heavyweight boxer Benjamin Caunt. The question is generated by the Marriott World of Rewards daily quiz. The question originates from the Marriott Daily Quiz. I’m surprised that no one has commented that Marriott pretty much blew it in their answer [“The Clock Tower or “Big Ben”, the worl’d largest four-faced, chiming clock, began operating on September 7th, 1859″]. 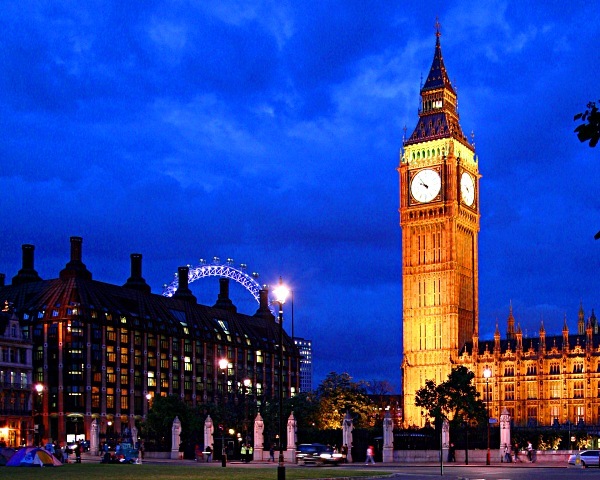 Technically Big Ben is the largest bell in the clock tower, NOT the clock or clock tower.